Agnew's Hill is probably the peak marked as Benwellerorie on Mercator's map of SE Ulster, 1595. Rory's Glen is a townland on the SE slopes, named after Rory Ogue McQuillan [OSM, vol. x, p. 118]. 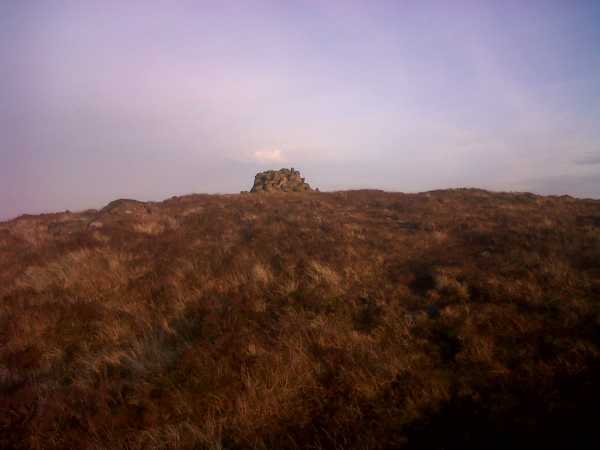 Benwellerorie may represent an anglicisation of *Binn Mhaol Ruairí, 'Rory's bare peak'. The English name is derived from the Agnews (Ir. Ó Gníomh), a family of Scottish stock who came to prominence in this area in the 17th century after the decline of the McQuillan's fortunes. Agnew's Hill is the 646th highest place in Ireland. Another beautiful November Saturday afternoon. Had planned to climb Slievetrue but the Woodburn forest area is now out of bounds due to a fungal infestation affecting the larch plantations there. So headed off to Agnew’s Hill instead. Started where the Antrim Hills Way crosses the Starbog Road. There is a stile on the left as you travel up from Larne direction. The stile is dedicated to Hugh Munnis, a local walker and historian who died in 2008 and helped popularise walking in the area. It was Hugh Munnis who informed the East Antrim Ramblers where the name ‘Starbog’ originated. Apparently it was named to commemorate the passing of a large fireball or meteorite in 1902 which passed over the area and landed near Crumlin. Bits of it are preserved in the National History Museum, London.